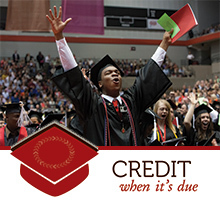 T2DG enables Ohio students to streamline credit transfer among the state's public institutions of higher education and from adult/secondary career-technical institutions to find the best pathways to degree completion and launch successful careers. T2DG helps students meet general education requirements, as well as requirements in 60+ career-oriented programs when transferring equivalent coursework. T2DG encompasses courses/programs offered by Ohio public institutions of higher education and adult/secondary public career-technical institutions. T2DG also includes Advanced Placement and military training and experience.